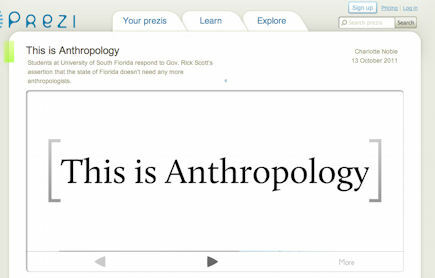 Anthropologists should send a thank you to the Govenor of Florida, Rick Scott, who a few days ago in a radio show said “We don’t need anthropologists in the state”. We don’t need a lot more anthropologists in the state. It’s a great degree if people want to get it, but we don’t need them here. I want to spend our dollars giving people science, technology, engineering, and math degrees. That’s what our kids need to focus all their time and attention on, those types of degrees, so when they get out of school, they can get a job. What an unique opportunity to promote anthropology! Daniel Lende at Neuroanthropology gives you an all-inclusive overview over the reactions to this attack on anthropology and the social sciences. Anthropologists love talking about themselves and the importance of their discipline, so Lende’s list is long. Personally, I think the students at the University of South Florida gave the most powerful response. They put a slide show together with short portraits of anthropologists and their work and put in online at prezi. “This is absolutely a brilliant presentation. The American Anthropological Association should use it as a model for communication, education and lobbying”, commented Jonathan Hass, and it’s difficult to disagree with him. Even anthropologists will be impressed and maybe also surprised about how diverse their discipline is - and how “relevant” and “useful” from the perspective of state bureaucrats. Their presentation is still in the making, more and more slides are being added. The Cairo massacre and How to invent "religious conflicts"
(preliminary notes, still in progress, last updated 16.10., 00:30 ) As everybody else, I am trying to make sense of Sunday night’s outbreak of violence in Cairo. While I was - unsuspectingly - walking through the streets of Cairo, trying to find the pasta stand I stumbled upon a week ago, the military was massacring protesters less than ten minutes by foot away from me at the Maspero State-TV building. At least 27 people were killed, more than 300 were wounded during a protest against religious discrimination and a recent destruction of a church in Upper Egypt. It is both interesting and disturbing to see how the event has been covered by international mainstream media in comparison to local and social media. International media has framed the clashes mainly as a religious conflict while they also could have chosen a totally different perspective: instead of “Muslims against Christians”, they could have chosen “the army against the people”. They could have described the clashes as conflict between forces who support the pro-democracy revolution (the people) and those that rather oppose it (the ruling Supreme Council of the Armed Forces, SCAF), as a conflict more of power than of religion. UPDATE: This sectarian language in Western media is, as Paul Sedra explains on Jadaliyya, not only inappropriate but dangerous. As several local commentators stated, the protesters who were attacked by the military were not exclusively Christians. Many Muslims joined the clashes, and fought against the army and police. At one point a Muslim cleric carried a cross over the 6 October Bridge, leading Coptic protesters in marching on Maspero [the TV-building]. The demonstrators chanted repeatedly: “Muslims, Christians.. One hand!” and denounced Mubarak’s minister of defence, who is controlling the country now - Field Marshal Tantawi. El-Hamalawy sees the current attacks on the Copts as an “attempt by the ruling military generals to split the ranks of the Egyptian poor and pit them against one another”. 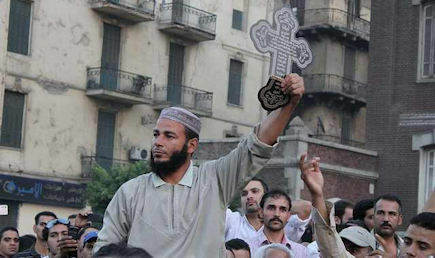 The presence of Muslim protesters alongside Copts are according to him “a hopeful sign”. “There were people on the streets from all different sectors of society. Copts, Muslims, other Christians, secularists, even Salafists. ”What united them was not anything to do with sectarian issues or demands but actually a frustration directed at the army for what they feel is the army’s betrayel of the revolution." Social justice for all, including religious minorities, was one of the demands of the january revolution. Omar Tarek, an activist and journalist, was one of the Muslim protesters. Around 300 Muslim and Coptic protesters were gathered at state TV-building Maspero, holding candles, chanting and calling for unity according to Daily News Egypt . Omar Tarek told the newspaper that the Coptic cause is the same as the Muslim cause. You can’t demolish a house of worship. (…) I am here as an Egyptian, supporting an Egyptian cause. Headlines like BBC’s Copts mourn victims of Cairo unrest suggest that Muslims or secularists don’t care which is not true. 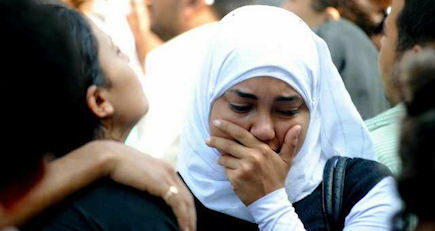 Many muslims joined the Copts at funerals. I am here supporting the families of the martyrs and I was hoping that a lot of Muslims would make it to show the whole world that it is not sectarian strife, but an army against its people. Following the funeral, hundreds of mourners, including both Christians and Muslims, solemnly headed to Tahrir Square bearing Mina’s coffin. There is no doubt that Reuters and others are right when they write that Copts are discriminated. Even tourists like me are realising that the Muslim-Christian relationship is a sensitive issue. But the news agencies neglect to mention that many conflicts have been initiated and provoked by the regimes in power (“Divide and rule”). The clashes, in which Christians say they were fired on and charged down by armored vehicles, highlighted an irony of the Arab Spring that the region’s dictatorships may have been better guardians of minorities than budding democracies. But in Egypt, many believe the recent clashes are a result of ousted president Hosni Mubarak’s policies, which nurtured sectarian strife, writes Heba Fahmy in Daily News Egypt. While many are quick to point out the marginalization of Egypt’s Copts, less are inclined to label the country as a sectarian state. Many observers have said that these underlying issues are often manipulated by authorities seeking to cling to power, an accusation often leveled against the Mubarak regime. Incidents such as Sunday night’s events are usually followed by widespread calls for national unity and shows of solidarity between Muslims and Christians. “We now know a previous massacre, the bombing of the Church of the Two Martyrs in Alexandria in December, in which 21 were killed, was the work of Mubarak’s ministry of the interior”, explains Egyptian short story writer Ahdaf Soueif in the Guardian. It was beyond sickening that a government would kill its citizens in an attempt to turn them against each other – and Muslims flocked to stand with their Christian friends at Christmas mass. So instead of accompanying their articles with background information about Christians in the Middle East (BBC) or Christians under siege in post-revolution Egypt (AP / ABC News), international media could have chosen to highlight the role of the military generals in Egypt as for example CBS’ 60 minutes did. As bonus track one could add a feature about the role of the West, especially the U.S. as sponsor. Here, the media, especially state media, seems to play a crucial role. A number of critics say that Egyptian state television not only failed to help resolve the crisis, but actually played a role in aggravating the already-tense situation. In an unprecedented move, broadcasters on state television at one point called on the Egyptian public to head to Maspero en masse to defend Egyptian soldiers from angry Christian protesters, thereby further fuelling the sectarian flare-up. On top of this, Issandr El Amrani writes at the Arabist, the military cut off the live TV feeds of several satellite TV stations, including Al Jazeera. International media treated Egyptian state and military officials as trustworthy sources. Manar Ammar from the Egyptian news site BikyaMasr had to conclude that "international media outlets largely reported on Sunday night Cairo what state television was reporting. After engaging in a street brawl where not a single person could tell who is with who or against who, they stopped a started chanting. One team started chanting “The People and the Army are one hand” and the others started chanting “Muslims and Christians are one hand”, thus providing us with the choices that we as Egyptians were told to make yesterday. And then, strangely, both sides at the same time changed their chants to “One hand”, and both sides started chanting that fiercely, stopped fighting each other, and joined each other into one big marsh chanting “One hand, One hand”, and thus showing us that they made the right choice. They were presented with the choice between the Army and National Unity, and they refused to make that choice and collectively and organically made the only correct choice: Each Other. Egypt. In the midst of the battle, they realized on a very basic level that they can’t chose one over the other, and that, even if they have prejudices, they really do not want to fight each other. There is a lesson in that incident for all of us, and it may just hold the key to our salvation. I am so angry. I can’t get over it. How dare they? I mean the shooting, the snipers, the crushing by tanks, the torture and the horrible ugly abject poverty are already too much to handle, and now I am supposed to hate Copts? Now, I am supposed to define them as the other. the other who is different than me, the other I should protect myself against? Well, I won’t. I refuse. (…) The God I believe in doesn’t like fascists. Today, Friday, people chant for Christian-Muslim unit at Tahrir Square and after the Friday prayers, a march is taking place from Al-Azhar Mosque to the Abbassiya Cathedral where the funerals for Sunday’s victims were held. Muslim Christmas Parties in Egypt = Celebration of religious diversity? Extremism: "Authorities -and not Imams - can make the situation worse"
Egyptian sociologist Mona Abaza has written an interesting article about “growing inequalities” between researchers from the Middle East and the West. “While the Arab Spring has enhanced global interest in the Arab world, local academics have often been reduced to service providers for Western ”experts“ who jet in and jet out”, she writes in the Egyptian news site Ahram Online. Many belonging to our scientific community have recently felt somehow “misused” through being overwhelmed by Western tourist-revolutionary academics in search of “authentic” Tahrir revolutionaries, needing “service providers” for research assistants, for translating, and newspaper summaries, for first hand testimonies, and time and again as providers of experts and young representatives for forthcoming abounding conferences on the Arab Spring in the West. Many overnight Middle East experts show a remarkable tendency to pursue sensational and market-driven topics and readily switch interest as the market forces fluctuate. One day they are self-proclaimed experts on “political Islam” or “Islam and gender” and another, they are authority on “the Arab Spring” and “pro-democracy revolutions”. This superficial and business-oriented handling of crucial developments and changes in the area affects how the peoples of the region are perceived and how policies are shaped in the West. Without sounding xenophobic, which is a growing concern that personally worries me more than ever, there is much to say about the ongoing international academic division of labour whereby the divide between the so called “theoreticians” of the North and the “informants” who are also “objects of study” in the South continues to grow. Namely, that European thinkers remain pervasively as the “knowing subjects” whereas non-Europeans continue to be the “objects of observations and analyses of European theorists”. Unless these issues are not brought up on the table of research agendas I am afraid that much will be said in the name of the revolution while perpetrating the same inequalities and Orientalist attitudes that are mostly felt in the job market, and in evaluating “whose knowledge counts more” in academe. Thank you Mona Abaza for having the courage to speak on behalf of local academics like yourself and journalists as well who are expected to offer their insight, information, years of hard work with the western tsunami that’s bombarding them (us). I’m personally sick and tired of having to do their homework for them. Where where they before the revolution and why do I have to give them my ideas? Judith Orr, a British leftist academic said earlier this year that the Egy revolution is a monumental historic event that will be studied for generations. So whatever difficulties in the relationship with Western academics exist, they will need to be worked out somehow. Or maybe not. (1) Reject the practice of organizing your bibliography around the three categories of archival sources, Arabic/Persian/Turkish sources, and secondary sources in European languages. Arabic sources should not all be lumped together - the primary sources of Arab ’subjects’ should be listed alongside those of European subjects and the secondary/theoretical writing of Arabs should be listed alongside that of Europeans and Americans, not in its own special category. Another commenter linked to a text on academic freeloaders that was posted on the Arabist blog four years ago. Globalisation in anthropology has mirrored unequal relations existing within larger structural processes. Theory, for instance, has flown from metropolitan centers to non-metropolitan centers while the flow of “raw data” makes the opposite movement. In order to trancend ethnocentrism and orientalism, he and several others edited the the book World Anthropologies. Disciplinary Transformations within Systems of Power . Kenyan anthropologist Mwenda Ntarangwi discusses similar questions in his book Reversed Gaze. An African Ethnography of American Anthropology. Who are the most ruthless capitalists in the western world? The banks? Oil companies? No, academic publishers! In an article in the Guardian, George Monbiot explains why academic publishers make Murdoch look like a socialist. Everyone claims to agree that people should be encouraged to understand science and other academic research. Without current knowledge, we cannot make coherent democratic decisions. But the publishers have slapped a padlock and a “keep out” sign on the gates. You might resent Murdoch’s paywall policy, in which he charges £1 for 24 hours of access to the Times and Sunday Times. But at least in that period you can read and download as many articles as you like. Reading a single article published by one of Elsevier’s journals will cost you $31.50. Springer charges €34.95, Wiley-Blackwell, $42. Read 10 and you pay 10 times. And the journals retain perpetual copyright. You want to read a letter printed in 1981? That’ll be $31.50. Monbiot’s piece has received lots of attention, the reactions have been mostly positive, including over at Savage Minds. Some researchers call for action. What, if anything, can we do about the tyranny of academic publishers? Here’s an obvious suggestion: so far I’ve been very ‘obedient’ and have never put final versions of my papers online (It’s always the pre-print version, uncorrected proofs etc. ), as required by the copyright transfer agreement. But now I’m thinking that that’s not the way to go; and if we all start putting final versions of our papers online, what are they going to do? Are they going to sue everybody, install a special department just to keep track of who has been posting ‘their’ valuable papers online for free? Moreover, open access journals should receive all our support. Especially established academics who do not need to ‘score points’ with ‘fancy’ publications would do well to contribute to open access journals so as to increase their reputation. If we all do it consistently, the day will come when publishing in a highly regarded open access journal will give you more ‘points’ than publishing in one of the overpriced journals published commercially. Monbiot’s article has served as an excellent wake-up call to researchers, but an alarm clock is not what is needed. We need a call to arms. 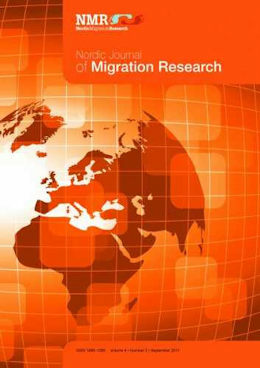 Researchers: get yourself a copy of Open Journal Systems installed. Get your journal set up and ask your library for support! This game has gone on too long and only through action can the system ever be changed. I am not a tenured professor. If I had academic job security, I could afford to publish purely in open access destinations, preferably Gold, Libre. As it is, I am still at the mercy of the metrics and systems that make publishing in closed venues a requisite for obtaining long term employment. Academic freedom is the freedom to hold a view; it does not extend to implementing the view. However, those who can afford to do so, should. Immanent critique has value. The people who solely value closed-source journals (who I would argue are unaware of the constraints they place upon themselves through such behaviour) undoubtedly perceive OA publications as being of less worth. By publishing critiques of the system they value, within a framework valued by that system, the message can be heard in places it would not otherwise reach, avoiding the “fringe looney” accusation. By the way, at the UK Scholarly Group conference next year – the biggest gathering of librarians and academic publishers - he will argue for that we don’t need academic publishers! In particle physics, everything worth reading is posted on the arXiv server, which is why I am able to link original articles from my blogs and you are able to read them free. No one I know would consider publishing in a journal which didn’t allow this. The Guardian has collected some comments on Monbiot’s pice in a follow up post. If subscriptions to academic journals in Britain consume 65% of library budgets, and three giant commercial publishers from Europe and the US control 42% of scientific journals, imagine what this means for libraries and institutions in developing countries. Not only can it be prohibitively expensive to gain access to the results of research but such practices also accentuate a “knowledge divide” between the global north and south. Addressing such a divide was one of the reasons for the Geneva-based Globethics.net Foundation setting up a digital library on ethics, which has more than 750,000 full-text articles and books available free of charge. Such initiatives offer a modest but determined attempt to redress the balance in global knowledge transfer. Fair publishing models by commercial publishers and open access efforts are needed to promote benefit sharing in knowledge production between north and south. I am a member of the group Sociologists Outside Academia. Our major problem is access to materials. The advent of the internet has worsened the situation because many libraries subscribe to online versions of journals only. So whereas in the past a vacation ticket issued by a sympathetic librarian might enable you to catch up on your reading, it now does not because the relevant journals are not on the shelves, and nobody will give a visitor an electronic log-in. Anyone who is not a member of a university is excluded from academic debate. While Jason Baird Jackson regards Monbiots piece as “a single article explaining much of what motivates me to work on reform in scholarly communications and academic publishing”, Kent Anderson on the blog by the Society for Scholary Publishing describes Monbiots article as uninformed, unhinged, and unfair. Important to note: Much what is said here applies to the English speaking world only. In Brazil for example, and Portugal, a large degree of social science articles are available open access online. As Maximilian Forte pointed out three years ago, innovations in the dissemination of anthropology are coming in large part from the so-called periphery, from the outside of the disciplinary centre of gravity. See the antropologi.info overview of open access journals and repositories. Here they are: Open access anthropology books! George Marcus: "Journals? Who cares?" More and more people are living in slums. What can be done about it? A few weeks ago I blogged about Safaa Marafi’s thesis about neoliberal policies, urban segregation and the Egyptian revolution. Now she has published a newspaper article that is a good example of public anthropology: Living in Slums … A Historic Dilemma that Needs to be Resolved!. Here she explains one of the most important anthropological insights. If you work with people, you need to understand their point of view. In order to solve the problems of slum life one needs to listen to the voices of the people who live there. Understanding their culture, needs and way of life is essential to help provide them with the necessary resources they need, whether proper education, job, medical assistance. Moreover, do they need small shops, kiosks, or commercial areas? From this stand point, I stress on the need to conduct serious research by social scientists to understand the culture of these people through one-to-one interviews and giving them the chance to express their needs and voice their concerns. Thus, this will assist in tackling the slumization phenomenon from its grass-roots. Anthropologists have stressed the importance of the “native’s point of view” in development projects for many years. Nevertheless, not only in Egypt, but also in Europe, people living in poorer neighborhoods are often stigmatized. Politicians and mainstream media tend to portray them as lazy and often criminal people that have to be “civilized”. So therefore, the poor are in policymakers’ view not worth to be listened to? Marafi’s piece reminded me of some articles about slum life that have been published recently. All of them attack these misrepresentations. One of them is the fascinating but sad story The life and death of Khanoufa: A personal account of Cairo’s “most dangerous thug”, written by Mohamed Elmeshad. Egyptian police claim to have captured a man they called “Cairo’s most dangerous criminal”. Elmeshad questions these and gives us the perspective from his neighborhood where some of them see him as a victim of the system he was born into. A system where being associated with a slum area limits your opportunities in life. “He turned out how he did because the police left him no other path in life,” Khaled, one of Khanoufa’s neighbors, said. At the age of 14, after participating in a neighborhood brawl, Khanoufa spent the first of a series of six-month stints in juvenile hall for youth misdemeanors. He became “marked” by police as someone they could pin crimes on or extort for money with the threat of imprisonment. When his father, Abdel Shakour, passed away, Khanoufa’s family could no longer afford to pay-off the police, and he began spending more and more desperate nights in prison. “That is when he turned to a life of crime. When he realized that he would be treated as a criminal for the rest of his life, no matter what. He reached a level of despair and said, ‘They’d take me in and put me in prison, regardless,’” Khaled said. He ended up spending half of his life in prison, from his teenage years until his death. Mohamed Elmeshad has written another article from the same neighborhood (Ezbet Abu Qarn): Cairo’s poorest residents help the less fortunate in Somalia – a powerful story about cosmopolitanism from below. A group of young men were moved by the images they saw in the media, and decided that the famine in Somalia must become a priority during Ramadan. Within four days, they were able to gather a large sum money among the poor people to the relief effort in Somalia. “There are old widows who rely solely on charity to stay alive, who donated what I know is a really large amount for them,” said Sayed Kamal, one of the organizers. “We don’t have people dying from hunger in our parts, but we do know poverty better than anyone else in Egypt, and we know about the fear of going hungry,” said Gamal Abdel Maqsood, a scrap metal dealer. The popular committees were formed during the Januar revolution to protect neighborhoods when police withdrew from the streets in the midst of nationwide protests that toppled former President Mubarak. Born out of a moment of chaos and fear, [the popular committes] proved themselves to be capable of self-organization in the days that followed. But most importantly, they proved to people that the end of “government” did not mean the end of the world. In this surge of grassroots activism lie potential forms for popular governance. The committees not only teach us about the specific issues facing each neighborhood, but together they can teach us something about how political representation, accountability and local governance work on the ground. Finally, just one week ago, Amnesty International has released a report about Egypt’s slums: ‘We are not dirt’: Forced evictions in Egypt’s informal settlements. Slum research: "Anthropology needs to engage in an activist way"
Urban anthropologist: "Recognize that people want to come to the big cities"